Ian: Could both of you tell me a little bit about the work you’ve done here, the kind of writing that you’ve done, what you’ve done with Nancy and how she’s helped you? Keith: She helps me with a lot of my work. Like when I need help with ideas she would always give me a couple ideas and then I would just pick one of those ideas and then do the rest on my own. I: So she helps you get started? I: And how does she do that? Do you have a conversation with her where you talk about different ideas? K: She says, “What do you want to write about?” and then I say, “Whatever’s on my head,” and she helps me like make it bigger I guess. Yeah. Nancy: That’s well said. Actually I think Keith has many many ideas and he has a great imagination but sometimes he just needs help sort of narrowing down the ideas and that’s a lot of fun to do because he has such a good sense of humor and we have fun. I: What’s your favorite piece from this year that you’ve written? K: Writing about why hip hop isn’t bad. I did a powerpoint. I: Did Nancy help you with that? K: Yeah a little bit. At the beginning. Like, the writing part she helped me with. I: So what did you say? Why isn’t hip hop bad? K: Because it can help relieve stress. Like let’s say you don’t want to do something you can always put your headphones on and then like it makes it better. Yeah, that’s one of the reasons. K: Yeah I had to switch it a couple times, cause I didn’t know what I wanted to write. N: That’s fine! That’s what writers do. I: How did Nancy, or how did you help him, help you figure out what you wanted to talk about? K: She helped bring up a lot of rappers. I had to think about the rappers so like, she gave me the idea about making a list. N: I got educated actually. And also listened to some of Keith’s original rap. K: Yeah, I got a song. It’s unreleased though. N: But it sounded good to me. I: That’s writing! That’s a really great way to write. So that’s your favorite piece of writing, what’s your favorite memory? What’s your favorite part about coming to the Writers’ Room? K: I like when you share your stories and you get the snacks. N: (Laughs) At the end, right? When the book is published? I: So you really like the book release parties? I: Do you like getting to go up and share your stories in with your friends and read in front of everybody? K: Yeah, but I be shy sometimes. N: Yeah, but you do it! K: Yeah, I do, but..
N: Some of you guys don’t want to do it at all but you do it. I: How does it feel to have those books and to see your writing in a book like that? K: That’s cool, because when I’m older and if I have kids I can show my kids that. A good memory. 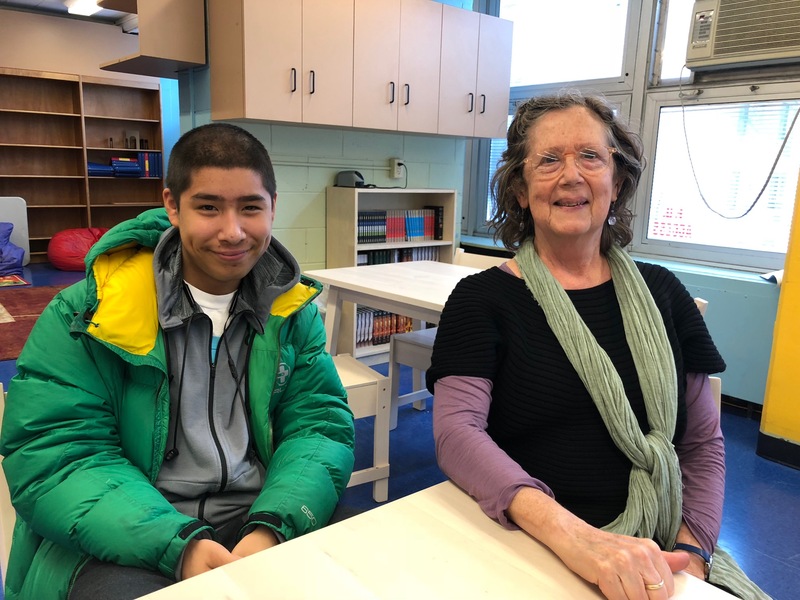 I: [to Nancy] And what’s it like for you as a volunteer to work with a student on a piece and get to see him read it or get to see it in these books? N: I really like working with many of the students, and what happened with that rap music and how that developed. At first you were writing about how there were some lyrics that people disapproved of and some lyrics that people don’t disapprove of. But then that wasn’t really what you wanted to talk about. And because we talked about all of it it sort of came out that what you wanted to talk about was how listening to rap – nevermind the lyrics, but listening to rap – made you feel good, gave you energy, all that stuff. Which is a lot different from, you know, the point of view of adults who just say “well, rap music is terrible.” So that came out of our conversations. N: And plus I learned a lot about that world. I: So what are you working on now? Can you tell us a little bit about something you’re writing now in the Writers’ Room? K: The sci-fi stories I think is what it’s called. Yeah, we’re doing that. I: What are you writing about for your story? K: It’s about man and he’s a robber. It’s like the Hunger Games kind of. So like, there’s a big circle where a bunch of rich people live in that big circle and you have to buy a house in order to live in that place. There’s no homeless people there at all. And everything surrounding that circle outside is like grey weather and there’s a lot of people in poverty. N: And the weather’s always great in the inner circle, right? Is that still part of your story? I: Is that like other things – something you talked about with Nancy, or with other volunteers, and started to figure out that you have this idea, and the volunteers help you figure out how to write it down? K: Yeah, cause we was reading the hunger games and when I found out we had to write something I thought of that and then put it in there. I: If you could, you’re sitting here with Nancy, if you could say thank you to her for something, what would you say? K: Thank you for helping me get my ideas out. Cause I have too many and it’s like I never know which one to pick. I: [to Nancy] And same to you, if you could say thank you to Keith. N: And I’d like to thank you for letting me get to know you a little bit and being very entertaining and being appreciative, too, cause I feel like you appreciate the work that we do together.